Kamau visits with the media about his quest for the NBA. Good luck to Kamau! Barry visits with the media prior to the MBB banquet about the NBA, next year's K-State players, etc. We wish him the best! Dean Wade visits with GoPowercat.com about his foot injury in the Big 12 championship win vs. Oklahoma, going pro, Texas Tech's success, etc. We wish him the best! Bruce Weber gave a very open interview to GoPowercat.com, prior to the Men's Basketball banquet today. BB&J wore a Reese's® Peanut Butter Cup uniform in the All-Star Game. He had 11 points, 5 assists and 4 rebounds in 21 minutes. (stats) I hope he gets his shot in the NBA. He's earned it! Here's a nice feature in the Kansas State Collegian posted by Molly Hackett. She visited with the mothers of Xavier Sneed, Dean Wade, Kamau Stokes and Barry Brown, Jr. This update on Dean Wade was posted by Arne Green of the Topeka Capital-Journal. I already had a huge amount of respect for Barry Brown, Jr. after his four seasons. 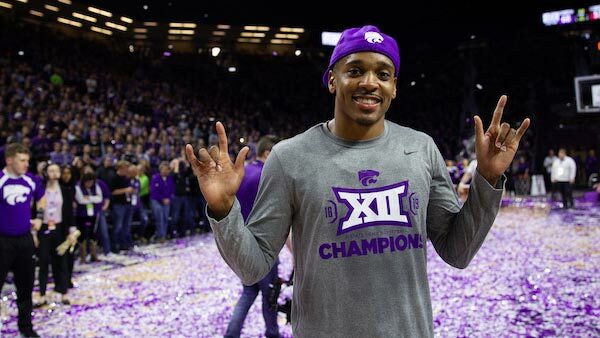 You must read Corbin McGuire's outstanding K-State Sports Extra, to understand how Mr. Brown, now #5 all-time in career points, became First Team All-Big 12. Here's a feature in the Manhattan Mercury. Here's Twitter video of the championship celebration. (and here's another version on YouTube) Here's a Twitter photo of Dean Wade kissing the Powercat. Speaking of Powercat, GoPowercat.com has video of Bruce Weber's press conference, and also Barry and Dean's postgame press conference. It occurred with 05:53 remaining in the OU game for the Big 12 championship. In postgame, Coach Weber stated that he didn't recall ever seeing Dean do a dunk like that. We have it for you right here (with six replays). Here's a K-State Sports Extra that looks primarily at the emotions involved in the championship game experience. Today's the day to tie the ribbons on an exceptional conference season. You have to feel good going into a championship game, led by Barry Brown, Dean Wade and Kamau Stokes. Here's Corbin McGuire's Sports Extra. Corbin McGuire collects our trade secrets from the Cats. Here's a nice look at Bruce Weber and the Cats, in the Kansas City Star, by Sam Mellinger. Ned Seaton has a must-read article in the Manhattan Mercury, making his case for Barry Brown being mentioned along with the gents with retired jerseys. Barry is now #5 all-time in scoring, and #1 in steals. Along with a fine look back at Barry's accomplishments, there's a great summary of accomplishments by other MBB greats. Corbin McGuire's latest Sports Extra has quotes from Dean Wade and Coach Weber. Coach has emphasized good passing as a key to victory. Coach Weber also compliment Barry Brown, Jr.'s decision making... for example, when he's starting a drive to the hoop. Because of Barry's success, opponents descend on him, which leaves a teammate open. This K-State Sports Extra has input from Kamau Stokes after eight consecutive conference wins... the longest string of them since 1973-74. Corbin McGuire's latest K-State Sports Extra focuses on the solid second half. The Cats trailed by three points at halftime. Coach Weber informed them he wanted a four-point margin in the second half. He got 10 points! At 00:51 in the second half, Cartier Diarra stole a pass. Three seconds later, he delivered a spectacular windmill dunk, improving the Cats' lead to 69-61. Here's the story in the Manhattan Mercury, and a video. Ryan Black of the Manhattan Mercury has the main recap of the glorious 74-67 victory over KU MBB. It was our seniors' first victory over the Squawks. Also, enjoy the game highlights video and game recap. Here Corbin McGuire has interviews with our Cats on the eve of the home KU MBB game. Corbin McGuire has posted a K-State Sports Extra reporting his visit with Hall of Famer Mike Evans during MBB's annual Legends weekend. Mike made quite a first impression on me. As I recall, he recorded 30 points in his first game as a Cat. 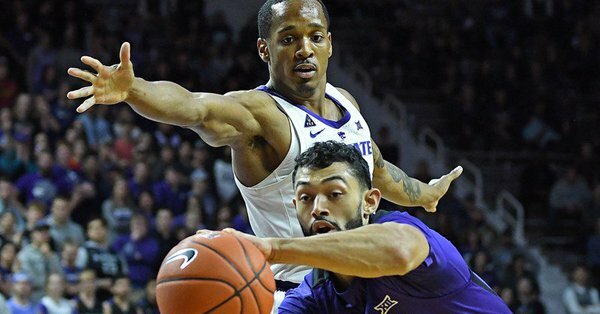 Compliments of Corbin McGuire, here's a link to another excellent K-State Sports Extra, focusing on defense, which has become the Cats' key to victory. Corbin McGuire's Sports Extra looks at this week's Big 12 Player of the Week, Barry Brown, and his winning shots in the Cats' last two games. We're certainly lucky to have him! Men's Basketball, on Jan. 9, 2019, updated the all-time record for the most points scored in a comeback victory, as the Cats defeated West Virginia. Barry Brown, Jr. added 29 points to the festivities. Here's Corbin McGuire's Sports Extra. Arne Green of the Topeka Capital has posted this fine game recap. In recent years, a group of K-State athletes from multiple sports have headed to Central or South America to do a construction project of lasting impact. Corbin McGuire's Sports Extra has the story, and a link to a video documentary. My compliments to the Cats who participated! After the Vanderbilt game on Dec. 22, their coach said, "I think that was the best half-court defense that we've faced this year." Along with that, Barry Brown, Jr. passed Jacob Pullen's record for steals (210). Barry came into the season with 189 steals, and obviously there are many games to go. Have a look at Corbin McGuire's Sports Extra. K-State's own Brian Smoller has a seven-minute visit with Coach Klieman. They discussed his relationship with Gene Taylor, how he got into coaching and his approach to recruiting. Something of no relevance whatsoever is I noticed that he talks about four times faster than Coach Snyder. Kenny Lannou and Gene Taylor co-star. K-State's Football recruiter, Taylor Braet, stars in this comedy video... a spoof of Home Alone, playing the Kevin McCallister role. (Twitter video) Do not miss it! 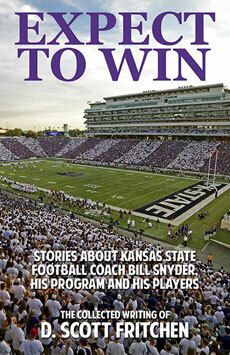 The Manhattan Mercury has two complimentary articles on K-State's A.D.: Who Is Gene Taylor? and Quote Roundup: K-State AD Gene Taylor through the eyes of those he worked alongside. Voice of the Cats Wyatt Thompson and "The Game" host John Kurtz reflect on Bill Snyder for 01:16, looking at his impact on their lives, and K-State, of course. Here's audio of it on Soundcloud. The K-State Alumni Association has commissioned a six-minute YouTube video that looks back at and celebrates Bill Snyder's leadership during the greatest turnaround in college football history. In Corbin McGuire's Sports Extra, we learn that Coach Weber wants to continue the momentum after the championship of the Paradise Jam. He wants a great non-conference record, and he wants Dean Wade to shoot! Corbin McGuire's Sports Extra tells our seniors' combined story, as they got acquainted, and later put together a list of what they want to accomplish in 2018-19. You know I'm never in favor of a KU victory... well, unless they're playing Baylor, I guess, but I wanted to link to Tom Keegan's final column, in his role as sports editor for the Lawrence Journal-World. I've seen him once a week, along with Fitz, on The Drive, which seems to have stopped getting updates to its web site. From The Drive, I learned that Tom is a real straight-shooter as a reporter, and extremely knowledgeable. He's been a great broadcast partner to Tim Fitzgerald, and I'll miss hearing from him. Area media are keeping us up-to-date with a federal court case in which Adidas® is accused of funneling $$$ to influence basketball recruits to play at certain schools. • Kansas City Star: How will KU hoops fight potential NCAA violations? This article includes 25 links to coverage of this subject by the Lawrence Journal-World. • 610 Sports: Bill Self's Press Conference "An Absolute Waste of Time"
Don't miss this fun video. Vahe Gregorian in has posted an extremely complimentary story in The Kansas City Star about Bruce Weber's national reputation for doing things the right way. Corbin McGuire's K-State Sports Extra has an informative look at Dean's recovery from the foot injury, and aspects of the game he's been working on during the off season. 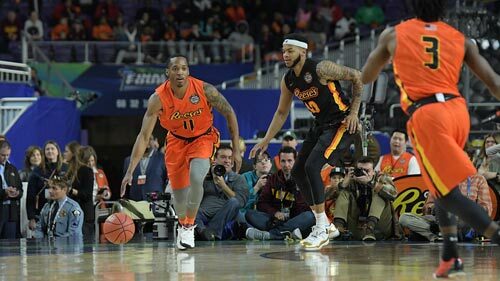 The great Rodney McGruder is with the Miami Heat, but was unable to play most of last season, because of a stress fracture. In the latest Sports Extra, we catch up with him, and learn how he has stayed involved with K-State Men's Basketball. 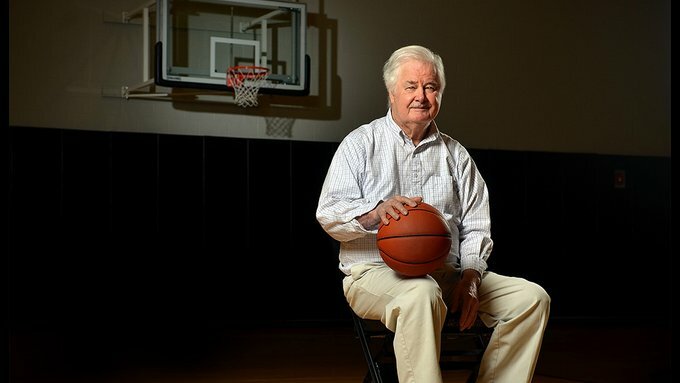 K-Staters far and wide mourn the passing today of legendary Men's Basketball coach Tex Winter. He coached the cats for 15 seasons, to 1968, and was an assistant with the Bulls and Lakers until his mid 80s. Here's the announcement of his passing from Athletics, and a link to his Wikipedia page. Here's an excellent tribute to Tex by ESPN. K-Staters are very proud to have Tex as a major part of our basketball history. OK... Mitch isn't 400. He's 61. He's called 400 Chiefs games, however. Here's a must-read profile in the Kansas City Star on Mitch, a K-State Hall-of-Famer (inducted in 2016), and Voice of the Wildcats from 1983 to 1996... but you knew that! Here's an encouraging story and video from Kellis Robinett for The Wichita Eagle! 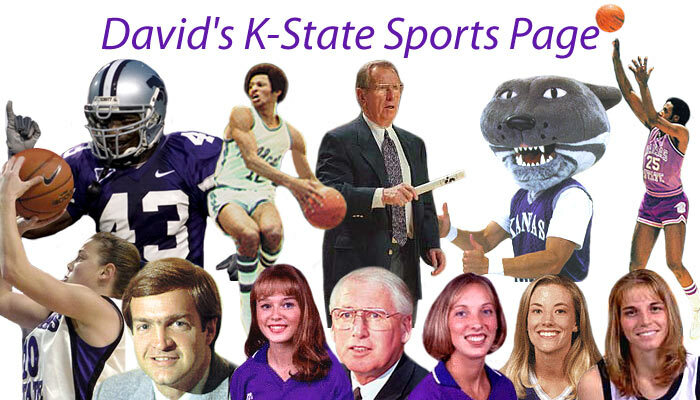 David Hall is going in K-State's Hall of Fame at the end of this month. Today he's the subject of Corbin McGuire's latest K-State Sports Extra. I remember distinctly being in the Ahearn crowd on January 25, 1971, when he set the record of 27 (which still stands) of Most Rebounds in a Game, as we played Oklahoma. Chris has graduated from The Wharton School of Business with an MBA, and now will begin his chosen career. I knew him throughout his K-State years. He is a true gentleman, and was always a hard worker. Here's Corbin McGuire's Sports Extra. 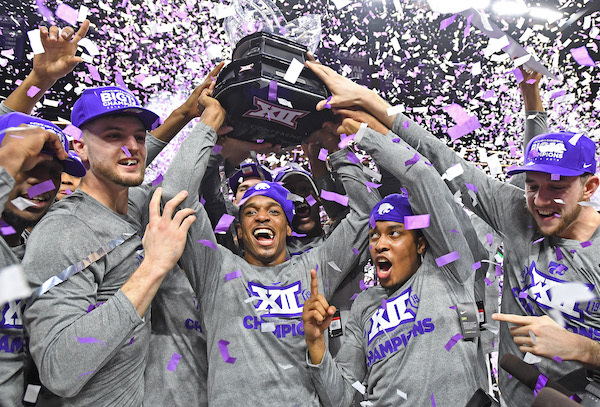 While some wondered if they would play past the Big 12 Tournament, Kansas State, with all starters returning, looks forward to the 2018-19 season knowing they're capable of great things, and certainly can be very competitive in the Big 12 race. With all this said, here's Corbin McGuire's Sports Extra. Go Cats! Corbin McGuire has an in-depth Sports Extra on Shane Southwell's path to being a graduate assistant, and how he looks at the game in a different way from the sidelines. Maryland-Baltimore County is the talk of the NCAA tournament after knocking off #1 seed Virginia two days ago. Corbin McGuire's Sports Extra gives us the thoughts of our players as we count down the hours to this critical encounter. The Cats played KU, another #1 seed in the NCAA tournament, to one point on January 13. I'm not sure why Corbin McGuire's Sports Extra came out the morning after the big win over Creighton, but we sure appreciate Mike's 17 points off the bench. Also, here are Mike McGuirl's postgame interview and the box score. 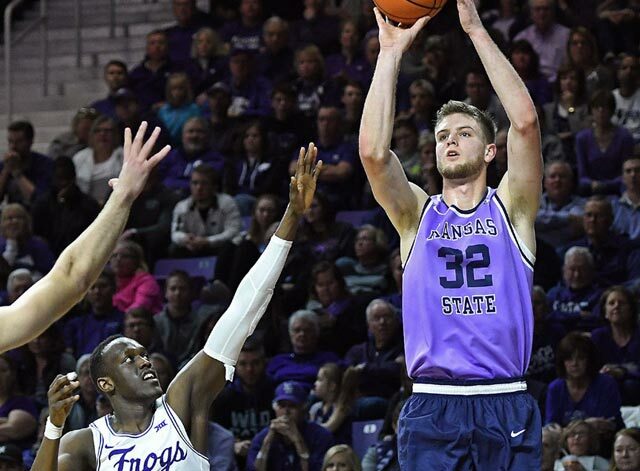 Corbin McGuire's latest K-State Sports Extra is a must-read about Drew Mount, who has just earned three straight Big 12 Newcomer of the Week honors – a first in Big 12 history. He eats turnips, and before batting, he warms up with a sledgehammer! I think it's safe to say that lots of guys will be copying him very shortly. This release from K-State Athletes has the good news about Drew Mount and Will Brennan, the Big 12's Newcomer of the Week and Player of the Week. You're going to have to deal with a fluorescent yellow Iowa State uniform to read Corbin McGuire's fine Sports Extra on our versatile NBA prospect, Mr. Dean Wade. Tim Bisel of The Topeka Capital-Journal has a well-done interview with Gene Taylor reflecting on Bruce. (I'm all-in for Coach Weber, by the way.) Gene is thankful to have a coach who doesn't cheat, and thankful to have fans who care enough to debate on their coaches. It was announced today that the Cats' junior, Dean Wade, is the Naismith Trophy National Player of the Week! The release linked here has a nice review of his impressive stats, and his part in our Cats defeating two ranked teams last week. While we're at it, it must be mentioned that Dean is the reigning Big 12 Player of the Week!! Gene responded to fan questions sent via Twitter. Brian Smoller hosts the video. (link) I sent in a question, wanting to know why all the historical pictures were removed from the Coliseum concourse. Other questions were about Bill Snyder's annual return-or-not drama, media coverage in the Kansas City area and the next MBB jerseys to be retired. It was awesome to have alums back for the American U. game. Here's a Sports Extra with comments from Schyler Thomas, Luis Colon and Bob Chipman. Coach Chipman was highly complimentary about Bruce Weber's coaching. Matthew McCrane ranks first in school history and sixth nationally for career field goal percentage, and first in school history in extra-point percentage (99.1). With three more made field goals, he will tie Ring of Honor member Martin Gramatica for most in K-State history, at 54. If McCrane makes one more field of 50 yards or longer, he will become K-State's single-season and all-time leader. Corbin McGuire's Sports Extra updates us on Matthew, plus other special teams successes, including D. J. Reed's. I'm sure it helps to have an All-American punter and Ring of Honor member, Sean Snyder, coaching them! This is an interesting announcement. I don't know if it will benefit me, as I can't get cable TV anymore, so I guess I don't have access to ESPN3. It's nice to have a new provider for K-STATEHD.TV, as the last one was awful. Brian Smoller will call the K-State Football games on this medium, which will be great. Here's a good get-acquainted interview with Gene Taylor, by Timothy Everson of the Dodge City Globe. If you don't look at anything else on this page, read Jordy's story, as told to Lori Nickel of the Milwaukee Journal Sentinel! Kellis Robinett has a good story on the 2016-17 MBB season, and goals for the next one. A close game was expected, which was supported by a 33 - 28 final score in favor of 9 - 4 Kansas State. The 42-21 stomping of Baylor sealed the deal officially, but we knew we had a bowl game two weeks ago, with KU still to play. Here's the link to Athletics' tickets page, a tickets pre-order page and the Alumni Association's k-statesportstours.com. Bowl games and opponents will be announced on December 4. I saw every varsity game Lon Kruger and Bob Chipman played or coached at K-State, and have always had tremendous admiration for both of them. Their exhibition game was played tonight, and OU defeated Washburn 84-64. Lon has coached five different teams to wins in Final Four games. Bob has won a national championship at Washburn, and will retire from Washburn in 2017 with around 800 wins. It's no accident that Lon, who last coached here 26 years ago, is still pictured at the top of this page. Here's the story from soonersports.com. Corbin McGuire has done it again, with an outstanding Sports Extra on Coach Bob Chipman. He looks back at his days playing for Jack Hartman in the early 1970s, and tells us how he uses what he learned playing here. Coach Chipman has collected a national championship at Washburn, and he and Carol gave us our outstanding Volleyball middle blocker, Kelsey Chipman Stringer, who helped cover a match for K-STATEHD.TV two days ago. I saw every game Bob played at K-State, and would have been very happy if he'd been K-State's coach. He will retire from Washburn in the spring. I think any Cat fan will enjoy reading this interview with Steve Henson, who is beginning his first year as a head coach, at UT San Antonio. Corbin McGuire, in another excellent Sports Extra, visits with K-State great Jacob Pullen about his basketball career. At last we learn the origin of "The Band Is Hot" on its 30th anniversary. Jeff Alton, a former drummer in The Pride of Wildcat Land, created it while a member, and on Sept. 17 he conducted the band along with daughter Natalie, an assistant drum major. Here's the story in the Collegian. Coach Weber was honored on Sep. 6 by Wartburg College for his charitable contributions. Have a look at this Sports Extra, and the announcement from Wartburg College. Countless K-State fans are delighted with the announcement that 580 Radio, WIBW Topeka will again be carrying Cat games. I've complimented Ben Boyle, now of Learfield, personally for his success in bringing this about, and want to repeat that here. Read the good news from K-State Athletics. John Currie and Dr. Frank Tracz host this video tour of facilities for The Pride of Wildcat Land, officials and visiting teams. What John Currie has accomplished in his seven years at Kansas State is amazing: the West Stadium Center, Ice Family Basketball Center, Rowing facility, Mike Goss Tennis Stadium and a completely new Vanier Football Complex are individually so impressive, but together are an unparalleled achievement. I was at every home game in Lon's three seasons as a varsity Cat, and just short of 44 years later, he's still my favorite player. Lon was Big 8 Player of the Year for two years. Here's a must-see feature on Lon from CBS Sports. Yes... his basketball nickname was Slick. You had Dan-o (Danny Beard), Gene-o (Gene McVey), Hobbs (Larry Williams) and Slick (Lon). Those were the days! Here's a nice story in the Los Angeles Times. Kellis Robinett has an article in the Kansas City Star that's an analysis of the season, and a look toward the next one. That's the title of an opinion piece by Tim Bisel for the Topeka Capital-Journal. While he concedes that commentary by fans should stay PG, he's not campaigning for political correctness. Bring on the hatred and hostility! During his 11 years as Voice of the Wildcats, Mitch Holthus was not only an exceptional broadcaster, but as fine a representative of Kansas State University as anyone has ever been. His thorough preparation for broadcasts brought a wide range of current information, and his unequaled memory of past events brought a perspective that added so much to his coverage. Mitch also added humor, fun and excitement in a way that made the broadcast, whether a game or coach's show, completely enjoyable. He told me years ago that his goal as a broadcaster is to inform, entertain and inspire. That he does! Here's a personal example of Mitch's brain power: My friend Jerry and I were visiting with Mitch after he did an ESPN broadcast for a Cats game in the Octagon in 2014. Jerry and I went to Midway High School, a consolidated rural high school outside tiny Denton, Kansas. Somehow or other, Jerry mentioned our school, which was built in 1959, being consolidated. Without prompting, Mitch chimed in "from Denton, Bendena, Leona and Severance." He grew up several counties away, was two years old when this happened, and correctly recited this obscure bit of trivia that occurred 55 years earlier. How, I don't know to this day. While broadcasting K-State games, we often heard Mitch's ability to recite the city and mascot of every high school in Kansas. Here's a well-done profile by Seth Davis for campusrush.com. Everyone should read Stanton's story of his journey from growing up as a Wildcat fan, to a walk-on for Bill Snyder's team, to team captain. In this YouTube commercial for Dove® Men+Care®, K-State Football Ring of Honor member Jordy Nelson tells about growing up as a farm kid in Riley County, to being a walk-on for K-State Football, to his current life as a parent and a wide receiver for the Green Bay Packers. Hilton Garden Inn - 410 S. 3rd St.